Washington, April 17 – In their latest campaign visit, New York-based Center for Disability Rights and Rochester ADAPT pushed Sen. Ted Cruz to comment on if he would cosponsor the Disability Integration Act (DIA) like Sen. Bernie Sanders has and Secretary Hillary Clinton supported. The DIA would ensure that people in need of long-term services and supports such as personal care attendants can receive these services while living at home or in the community instead of in an institutionalized setting if they wish to do so. However, despite being seated in the front with visible signs, Cruz did not comment about the DIA or any other disability issue while on the stump in Rochester. 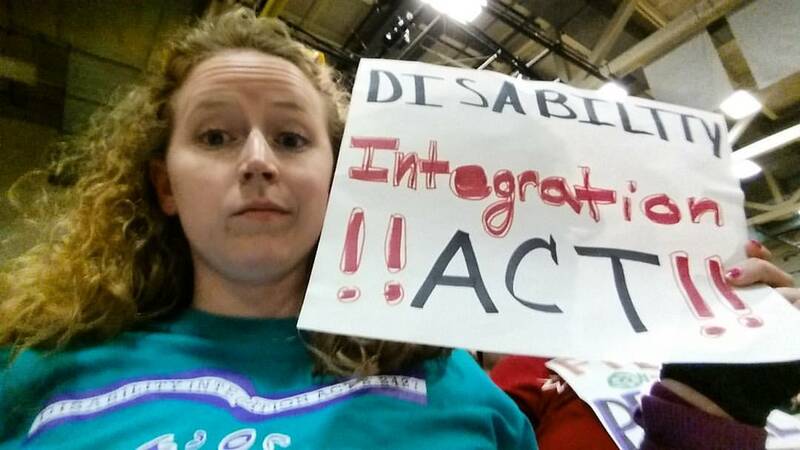 UPDATE: @TedCruz doesn’t support the Disability Integration Act! 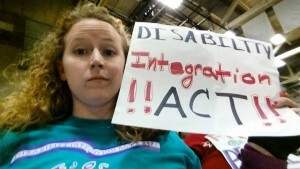 #Cruz #DIAToday #FreeOurPeople #ourhomesnotnursinghomes Despite knowing about our issue in advance, despite seeing us in the front row, and despite hundreds of emails and a few office visits asking for him to support the Disability Integration Act, Ted Cruz refused to answer us. I asked him directly if he supports the Disability Integration Act, he refused to give us a yes or a no. If it’s not a YES, it’s a NO. Plain and simple. 64 years living in the community, just 1,146,316 individuals were employed – that is only 15.9 percent. Studies have shown that it is more cost effective for people to live at home with proper services than to live in institutionalized settings such as nursing homes where people with disabilities can no longer participate and contribute to society by working and paying taxes. None of the Republican candidates for president have stated if they support the bill although Gov. John Kasich recently spoke about the topic in Greece, New York.